Are you looking for a better way to develop a guideline, learning tool or training modules for your teams or business partners? Provide your teams with a Visually beautiful tool, made for Interactive experiences, that delivers information in a bite-size, Approachable way. Research has shown that people remember visual images better and more easily than they remember words. We’ve looked at how people prefer to learn and play, and used this approach to develop a highly visual, interactive, and approachable platform for learning, training, and storing information. Watch this story about Emma, a sustainability manager who was asked to develop a fire safety guideline for her suppliers. Perhaps this is a story familiar to you. 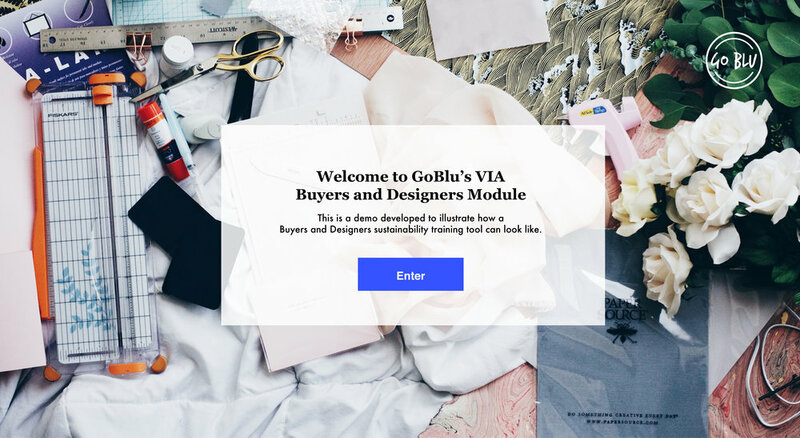 GoBlu’s VIA platform is flexible and can be tailored to a variety of needs. We have a library of content that you can pick and choose from to make the tool to your liking. Or, you can incorporate your existing materials and convert them into our tool. The look and feel of the tool is also customizable. We can integrate your company's images, colors and fonts, too! Talk to us and find out more on how VIA can help your teams visually and, interactively learn in an approachable way.